Ah, I love it when two of my favourite things come together in one shoe! 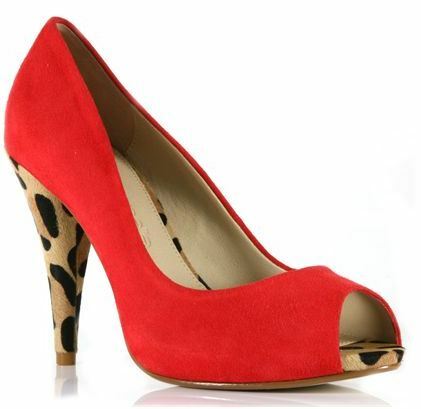 I mean, I love red shoes, and I love leopard-print shoes: I was always going to love a red shoe with a leopard print heel and insole, wasn’t I? In this case, Moda in Pelle have helpfully made this shoe even easier for me to love, by putting those two colours on a beautifully shaped peep toe, with a conical heel and curved side. At 4.4″, the heel is pretty high, but there’s actually a small, covered peep toe in there too, which should make these more comfortable, too. As well as red, these come in a few other colours, too: there’s a black upper (also with a leopard print heel), yellow and taupe versions (with reptile print heels) and plain red. These are my favourites, though, and they’re £79.95: click here to buy them at Moda in Pelle. Love them! Red would definitely be my choice too.